IT’S THE DAY BEFORE Armistice Day and I had to go see my accountant in Harrow and take a short cut, through the park and via a cemetery. It’s a short cut, normally. The man had a map of the local Harrow graveyard and he was on a mission to honour a certain World War One chap called Finch, who fought for the 4th Hussars and who was highly decorated. I hadn’t realised that detailed maps of graveyards existed with names and that. So I helped the man, who had served 28 years of distinguished service in the Hussars, on his quest to put a wreath on the ex-soldier’s grave. Alas, there was no headstone but we located where Finch had been laid down. My job was to take a photograph of the decorated alive soldier honouring former members of the regiment, standing where the gravestone should have been and putting a wreath next to Finch’s grave. The cemetery has been vandalised with everything higgledy-piggledy and topsy turvey as well tuti-puti. Job done, we fell to chatting about my job in Bangalore. Transpired the soldier was on a mission to go to India and to Egypt, where the Hussars had fought. In the first case, the Hussars apparently helped to suppress the “Indian Mutiny” which I was at pains to point out is now called the First War of Indian Independence. The soldier had just come back from Russia, where apparently the Fourth Hussars fought too – perhaps at Sebastopol, in the Crimea? The second world war in Russia is now called, of course, the Great Patriotic War. This was all rather strangely moving. The man was clearly on what he considered to be a sacred mission to track down former heroes in the Hussars, and register their presence. As I said to him, I was born in 1949, and so had been the luckiest soul to escape major wars, unlike my parents and their parents before me. I have never been pitched into battle, except in the famous “laundry wars” of Ole Bengaluru. I can hardly conceive what war is like, although my Uncle Joe not only had to swim back to a barque from Dunkirk, and then had to fight Rommel’s troops in the Second World War as a member of the “Desert Rats”. HECK, that was a hairy day here in Ole Bengaluru. First C.Shanti gets boasting about Eva Glass, then our domain name www.itexaminer.com mysteriously enters a parking lot in Texas and starts to migrate East. We managed to get it out of the parking lot and the DNS started seeing double for a few hours, but we’re up and running again now. So what’s happening in Bengaluru? Plenty. It’s cool here, unlike Mumbai yesterday. The building next to our office was demolished by a team of people with their bare hands in the space of two weeks. The little squirrels who used to entertain us by moving from the Gulmohar to the building have been unceremoniously thrown out on the street although we did spot one on a far off building, earlier. Pretty soon, the empty space next door will be occupied by a nightwatchman, and then by a man with a uniform and a hat, and by boys unbending iron bars to provide the shuttering for the continuing concreting of Bengaluru. My folk in the editorial office look bemused as I show them a copy of the Daily Mail, and amused to read the Mick Jagger feature about his “65” girlfriends now he’s 65. They have heard of the Rolling Stones. Bengaluru has festooned itself with signs saying that Bangalore is in your DNA. Is it? The metro – “our metro” continues to make the congested streets of the city even more congested and so life goes on as normal, despite the bombs of last week. So farewell Centre of Laundry Excellence! WE BID A sad bye bye to the Centre of Laundry Excellence – otherwise known as the Executive Inn on 12th Main, Bengaluru last week, close to the ESI Hospital, the Shiva Shakti temple, and the Kali shrine. If onions weren’t aphrodisiacs we would be pretty sure that we would have jammed a few into our eyeballs and let the eye monsoon break free. Something bizarre happened during our last week at this excellent guest house. The breakfast area, now famous for its poached eggs, was totally transformed into a Zoroastrian restaurant, complete with winged bulls and that. We believe the Zoroastrian restaurant opened today. We wouldn’t know. We’re back in Blighty and the trip to Bengaluru airport only took 45 minutes this time round, thanks to Reliance car service Meru. These guys at Meru Taxis work between 15 and 24 hours a day and it really is a miracle that they manage to stay awake while ferrying people backwards and forwards from BIAL. NOW THAT WE have reached the dizzying heights of number one and number two when you search for “laundry wars” on Google, we thought it was time to reveal the secrets behind the stories. Many of our reader – yeah that’s right – one reader, has asked how our laundry is packaged when it turns up as it infallibly does. Here are the facts. The laundry turns up in a brown paper bag. In the case of this shot, one brown paper bag. Thus we have ripped apart one bag – or as Isuppli has it “torn down” one bag, which sits on top of three other unmutilated brown bags. 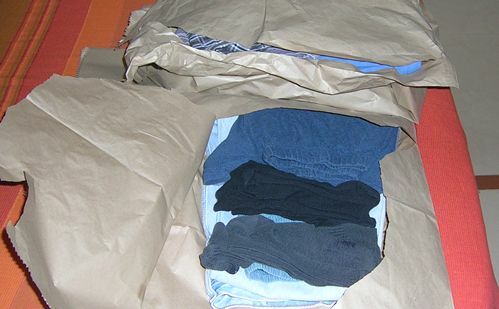 THE CLEAN pair of shorts that the Centre of Laundry Excellence wrongly assumed needed to be laundered have tipped up again, in as pristine a state as they left our custody. But in another move in the Laundry Wars, the laundry bag in the closet that said removal of the laundry bag would attract a fine has gone. We haven’t taken it. We presume it’s gone out to be laundered.